Today was boiling hot on site. It was officially 33 degrees in Rome but it felt like 36 in Ostia, and in the windless cistern it must have got much hotter. I lift my hard hat to the drawing team recording the late roman stylobate down there. To combat the heat we spent part of the day giving the team a site tour after a week of thankless backfill clearance. 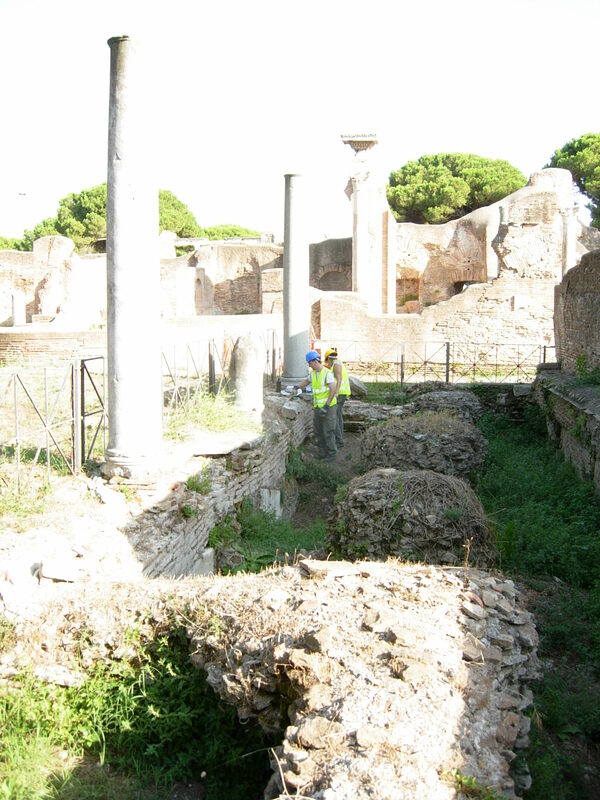 We have begun devegetating the 4th c. nymphaeum opposite the macellum for excavation and photography. We seem to be coming directly down onto a hard mortar floor, though it has a few holes in iit which might permit sondage. We would like to find some late antique votive oil lamps, like in Corinth, but probably this is too much wishful thinking. The geophysics unfortunately isnt working. A problem with the machine is preventing the palaestra being surveyed. Helen Harrington is thinks that she can resolve this so there may be more news on this front soon. In the meantime we are investigating the layers beneath the macellum in the NW corner. Here a we are contexting a republican road which was cut and covered over by our macellum. New supervisor Zsolt Magyar is doing his best to work out the sequence here, before moving on to study thje late antique layers in this area.